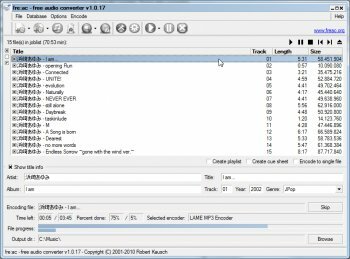 fre:ac is a free audio converter and CD ripper which integrates various popular formats and encoders. It currently supports MP3, MP4/M4A, WMA, Ogg Vorbis, FLAC, AAC and Bonk files. 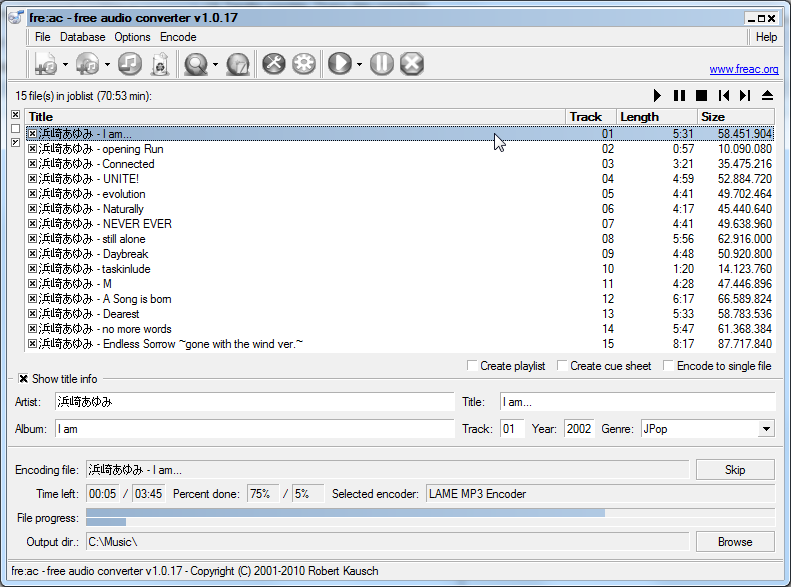 fre:ac makes it easy to convert your audio CDs to MP3 or WMA files which you can use in your hardware player or with your favorite audio software. The program supports the CDDB/freedb online CD database and CDText and automatically writes song information to ID3V2 or Vorbis comment tags. Works fine without incidents, won't appear in the Windows control panel, add remove section and uninstall is only possible through its own uninstaller. great program. could use a solid update though. Does what it says on the tin. I just wish the interface was more coventional. 1019 is performing better than 1018 to be sure, with no crashes when dragging and dropping to the joblist, but 1016 is still working faster and it seems better. But it does appear 1019 is getting back on track. Historically, I'm one of this apps biggest fans - it just veered off course a bit over time is all. Until and unless this app gets to be as good as 1016, I can't grade it higher. DudeBoyz I have had no problems running fre:ac on my AMD + Windows 7 Home Premium x64 based PC. It is IMHO one of the best CD rippers available. The fact that it is free is just a bonus. I have just up-graded to this latest version but not tried it yet. That said, I have no reason to believe it will cause any problems. I hardly ever give software products a 5* rating but this one deserves it. 1.0.16 is the last version that I have had success with. Both 1.0.17 and now 1.0.18 I have had problems with, so I will stick with 1.0.16 and probably go no further for the foreseeable future. I liked it better when the product was called Bonk Encoder anyway, and 1.0.16 was, I believe, the last version still named Bonk Encoder. This version is much more stable than 1013, though it does still have bugs, even a glaring one in the interface involving the Total Time computation. That said, many of the MP3 files that used to make BonkEnc choke and crash do not do this with 1014. Perhaps they updated the Decoder to a newer version or something that fixed that. Regardless, it looks like it does a better job than before with those troubled MP3 headers. It's not keyboard friendly in the main "Job List" interface, and that's a pain. I don't like how it forces a pop-up "Info Box" when you move the cursor over an entry in that list - it's distracting and should be allowed to be toggled off. A more detailed Change Log would be welcome as well. Converting of some actual MP3's seems agonizingly slow, but I can't pin down what that's all about yet. I'll need to do more testing. Still, it is a step up over 1013 and the interface feels fast like it used to be in 1012. I hope the positive trend continues. interface is clean but some think dated , but if it works why do you have to make it bling filled to say its new? it works and is easily understandable that is what counts. On a general note, the MP3 Decoder can be a bit iffy. I understand that they will be switching to a more robust decoder that can handle MP3 files that have non-standard headers, are in bad shape from "Trim and Cutter" operations and the like. I hope that works out well. this is a sweet proggie. works as described with nice options - easy for noobs but, good tweakability for pwr users. clean install and sleek interface. luv it. Still the very best at what it does, at least for me. Only weak point I have found is that the converter sometimes chokes on MP3 files that may not be fully in compliance with the spec. It's not very forgiving with those so when it does gack on those, I convert them to WAV with Music Match then encode those to MP3 with the built-in Lame encoder. I have heard that the next phase of the development will introduce a more forgiving MP3 reader, so I'll be looking forward to that. 1012 feels nimble and stable and is a breeze to use. Please keep up the good work. Fast, easy to use, powerful, free, and most importantly... Open Source. The best for converting and ripping to your favorite audio format whatever it may be. The quick setting changing is great for using a different format on the fly. 5/5. Kudos to PortableApps.com for making a portable version as well.